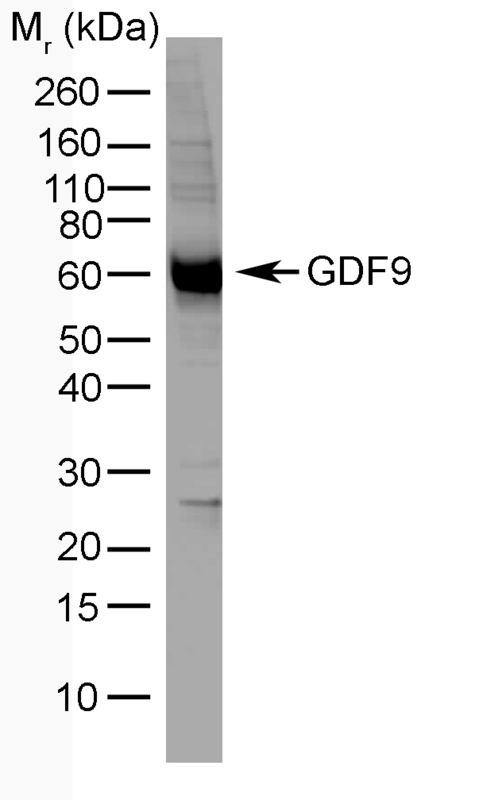 GDF9 over expressing lysate probed with Mouse anti Human GDF9 antibody, clone mAb-GDF9-53 (MCA5635GA). Mouse anti Human GDF9 antibody, clone mAb-GDF9-53 recognizes an epitope within the highly conserved EPDG sequence of GDF9 (growth differentiation factor 9), a 454 amino acid ~51 kDa pro-protein which is cleaved to form a ~17.5 kDa GDF9 monomer which self associates to form an active homodimeric growth factor, a member of the TGF-beta superfamily, closely related to bone morphogenetic proteins (BMPs). GDF9 is expressed by oocytes, playing a vital role in ovarian folliculogenesis, normal follicle development, and fertility. GDF9 signals through binding to bone morphogenetic protein type II receptor (BMPRII), and apparent subsequent activation of TGF-beta type I receptor, otherwise known as activin receptor-like kinase-5 (ALK-5). Mouse anti Human GDF9 antibody, clone mAb-GDF9-53 recognises GDF9 with high immuno-affinity, and has been shown to neutralize GDF9 biological activity (Gilchrist et al. 2004, Dragovic et al. 2005). Removal of sodium azide is recommended prior to use in functional assays – Bio-Rad recommend the use of EQU003 for this purpose. Tuberculin coupled synthetic peptide VPAKYSPLSVLTIEPDGSIAYKEYEDMIATKC from near the C-terminal region of mature human GDF9. Gilchrist RB et al. (2004) Immunoneutralization of growth differentiation factor 9 reveals it partially accounts for mouse oocyte mitogenic activity. Biol Reprod. 71 (3): 732-9. Dragovic RA et al. (2005) Role of oocyte-secreted growth differentiation factor 9 in the regulation of mouse cumulus expansion. Simpson, C.M. et al. (2012) Activation of Latent Human GDF9 by a Single Residue Change (Gly391Arg) in the Mature Domain. Watson, L.N. et al. (2012) Heparan sulfate proteoglycans regulate responses to oocyte paracrine signals in ovarian follicle morphogenesis. Li, J.J. et al. (2014) Modifications of human growth differentiation factor 9 to improve the generation of embryos from low competence oocytes. Mottershead, D.G. et al. (2008) Characterization of recombinant human growth differentiation factor-9 signaling in ovarian granulosa cells. Mol Cell Endocrinol. 283: 58-67. Pulkki, M.M. et al. (2011) The bioactivity of human bone morphogenetic protein-15 is sensitive to C-terminal modification: characterization of the purified untagged processed mature region. Mol Cell Endocrinol. 332: 106-15.